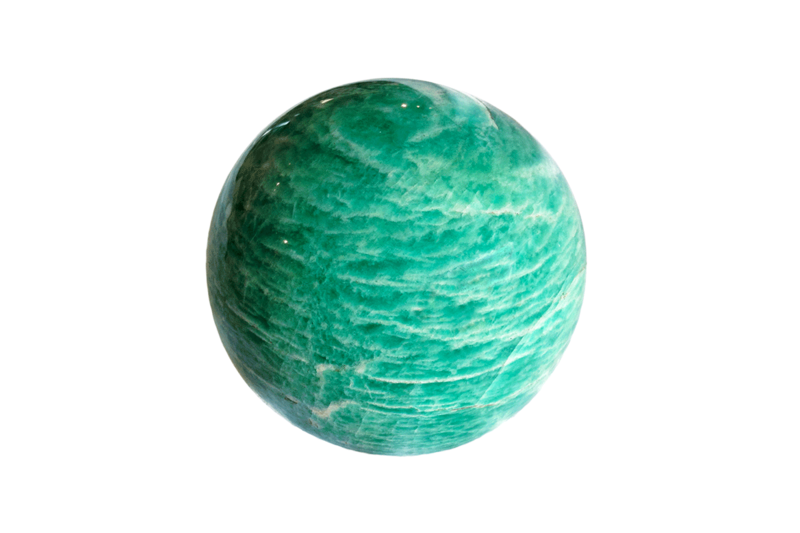 Amazonite is a translucent to opaque mineral, that comes in shades of green. This stone was named after the Amazon River, though no deposits have been found there. Amazonite can come with white streaks in them, creating beautiful patterns for jewelry designers to highlight. Though it isn’t often used in jewelry, but when it is, it’s raw design and coloring is often the focal point. This past year at AGTA GemFair in Tucson, AZ (one of the largest and most premier trade shows for color gems) blues and greens were some of the favored colors for gems. Amazonite’s vibrant color and streaked design provide a unique way to add blue and greens, other than traditional emerald, tsavorite, turquoise or sapphire. Due to their speckled design, oftentimes jewelers will use larger pieces of Amazonite, wanting to focus on their patterns. 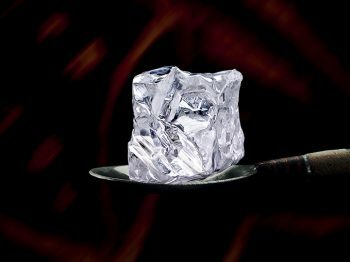 In 2017, Italian jeweler Pomellato unveiled a High Jewelry collection that was dedicated to hard stones. 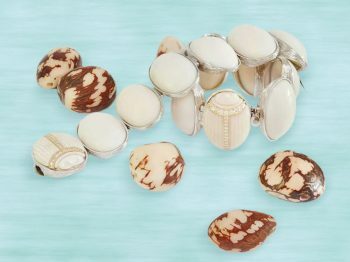 These cocktail rings feature a variety of exclusive gemstones such as tiger’s eye, malachite and amazonite. Creative Director, Vincenzo Castaldo wanted to emphasize the particular features of these stones, and used a portrait cut to do so. He wanted the stones to portray a story or evoke a landscape. 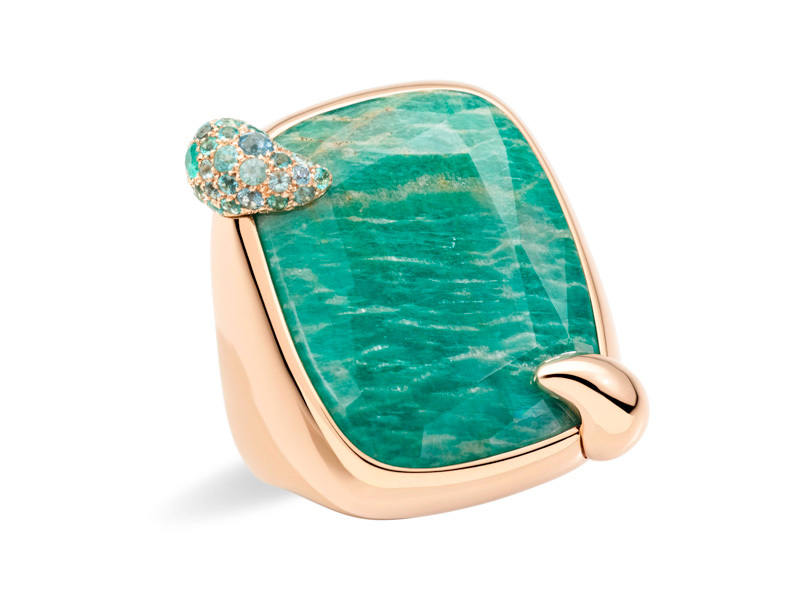 The Summer Paradise ring resembles the wild waters of a foamed ocean by using a greenish blue amazonite, with white features. These gemstones are then framed by gold and other smaller melee stones. 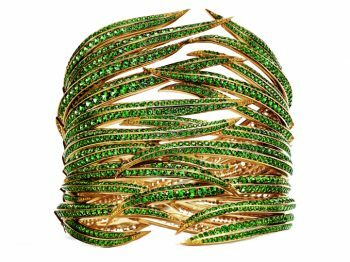 Parisian jeweler Hélène Prime has a passion and love for stones, especially those of bold design and color. She has utilized amazonite in a number of her pieces, both as large center stones and some smaller side stone pieces. 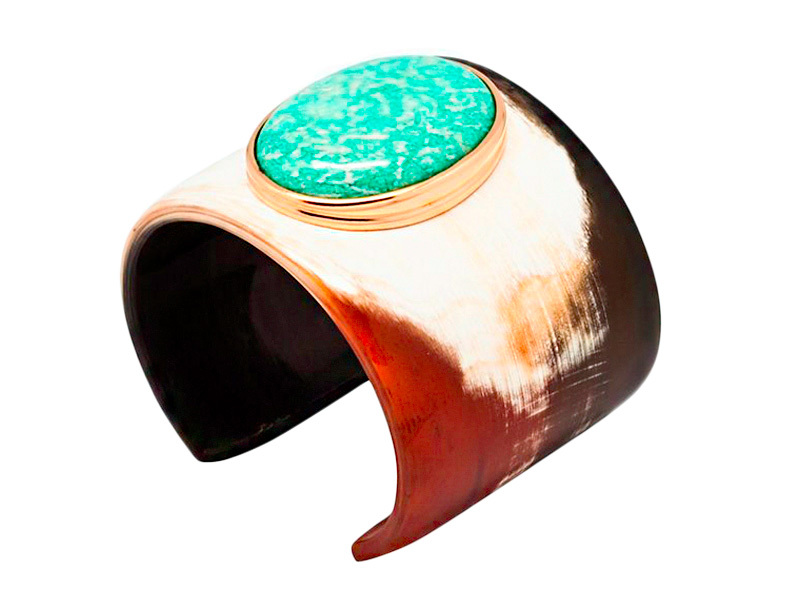 Her Horn Cuff collection is made of a large piece of horn, shaped into a cuff. Centering the piece is a large piece of stone, and here she makes one with a gorgeous piece of greenish blue amazonite with white and cream colors dotted throughout. We also see smaller pieces of amazonite as counterparts to pairs of earrings or necklaces, where other stones are the larger main focus. Amazonite can have a subdued color, one that is perfect for accenting another main stone. Artists that decide to use amazonite are most often attracted to the raw like features of this stone. The mottled design of amazonite is quite different to that of a polished transparent gemstone. Utilizing big pieces of amazonite is a perfect way to highlight this unique stone!